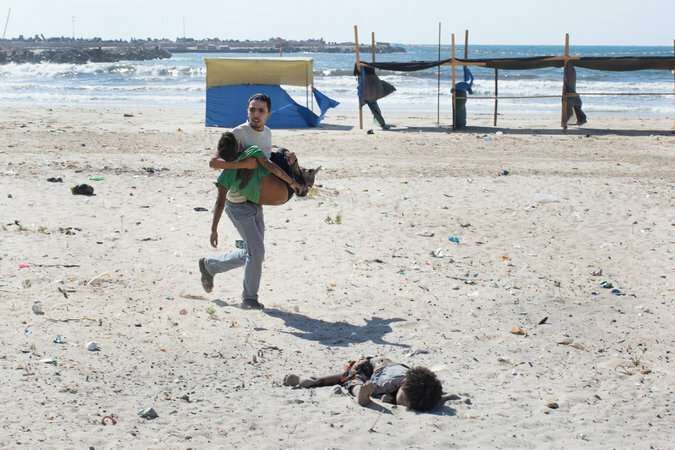 Even the shameless Israeli state seems momentarily shamed, as it has announced a five-hour ceasefire in their bombardment of Gaza after having shelled to death four Palestinian children who had been playing soccer on a beach, thereby presumably serving as “human shields” for Hamas fighters ingeniously hiding under the sand. “Eye for an eye” probably wouldn’t make the whole world blind. But, “the eyes of your children and neighbors for an eye,” sure as hell will. This bombing campaign of collective punishment is bloodthirsty, rank tribalism of the most primitive sort. Every American should be as aghast as Pearl Jam’s Eddie Vedder recently expressed himself to be that his tax dollars are paying for it. Posted on July 11, 2014 July 11, 2014 Categories Gaza, Israel, PalestineAuthor Dan Sanchez65 Comments on Exchange of Projectiles? Numerous headlines in mainstream American coverage of Israel’s assault on the Gaza Strip feature language about Israelis and Palestinians “exchanging rocket fire,” which conveys to the American public the sense that it is a matter of a “battle” between two neighboring “powers,” instead of the bombardment of an occupied territory; as if there was any kind of equivalence between the 400 tons of explosives that have rained down from Israeli jet planes, and the primitive, unguided rockets being lobbed from Gaza. The former has, in just a few days already killed over 100 Palestinians, mostly civilians, and including at least 13 children. The latter has resulted in zero Israeli deaths, and only 7 injuries. It’s rather like a scrum of cops assaulting a prostrate man with batons and tasers, and the media calling that a “fight” instead of a beating, because the man, as he flailed about under the blows raining down on him, kicked the leg one of the cops. The Palestinians aren’t allowed to leave; the Gaza Strip is a giant open-air prison camp. They have no air raid shelters or sirens. They are like fish in a barrel, being blasted by a shotgun from above. It’s like some of the fish in the barrel pathetically spitting water at the gunman, and calling that a “shooting battle.” Indeed one has to wonder, if the economic blockade and the destruction wrought upon the Palestinians were to reduce them to such penury that they no longer had enough materials for rockets, and were reduced to only throwing rocks while continuing to have 1-ton smart-bombs dropped on their houses, would the American mainstream media call the affair an “exchange of projectiles”?